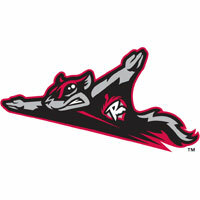 The Richmond Flying Squirrels (28-23) scored double-digit runs for the fourth time in the last five days and pasted the New Britain Rock Cats, 10-5, on Wednesday night at New Britain Stadium. The victory runs the Squirrels win-streak to five games – their longest of the year. Over the course of the streak, the Squirrels have scored 61 runs. During the surge for Richmond they have outscored their opponents by 35 runs. The Squirrels grabbed the first lead of the night with an unearned run against right-hander D.J. Baxendale in the third inning. Baxendale walked Javier Herrera with one out and conceded a single to Jarrett Parker. With two aboard and one out, Joe Panik sent a grounder to the right side. First baseman Reynaldo Rodriguez misplayed the ball, and the bases were loaded. Adam Duvall then sent a well-struck one-hopper to the shortstop Danny Santana. He fumbled the double-play opportunity, and Herrera crossed for a 1-0 lead. Mark Minicozzi followed and did ground into an inning-ending double play. New Britain also used a defensive miscue as a spark as they claimed the lead for the first time against right-hander Craig Westcott in the bottom of the third inning. Kyle Knudson led off and sent a ground ball that was misplayed by Panik at second base. Chris Pettit followed and sent a rocket off the base of the wall in left field. The double put runners at second and third. James Beresford followed with an RBI single to tie the game, 1-1. With runners at the corners, Westcott picked off the runner at third for the first out of the inning. However, Josmil Pinto sent a double to the right-field corner to plate Beresford for the lead, 2-1. Jordan Parraz then made it 3-1 with a single into right field. Richmond came right back in the top of the fourth, plating a pair to again level the ballgame, 3-3. Andrew Susac got the Squirrels started with a one-out bunt-single. Ehire Adrianza followed and punched an RBI double into the left-field corner. Adrianza took third on the throw home and scored to tie the game on a sacrifice fly from Ryan Lollis. The Rock Cats briefly regained the lead with a run against Westcott in the bottom of the fourth inning. However, the Squirrels seized control of the ballgame and chased Baxendale in the top of the fifth. Panik sparked the Squirrels when he flared a single into center field. Duvall followed and clocked a two-run home run to left-center. Duvall’s fourth of the year forged Richmond back in front, 5-4. Minicozzi got it going again for Richmond as he extended his hit-streak to 14 games with a double down the right-field line. Baxendale got the first two outs, but Adrianza yanked an RBI single into right field. It was the second hit and RBI of the night for Adrianza. Baxendale then walked Lollis and conceded an RBI single Herrera before calling it a night. Left-hander Jose Gonzalez came on for him and Parker greeted him with an RBI single into left field for an 8-4 lead. Baxendale (0-1) was saddled with the loss in his Double-A debut, charged with eight runs – seven earned – over 4 2/3 innings. He conceded nine hits, walked two and struck out two. Westcott (3-5) wasn’t his sharpest, but he earned the win over six innings. He was charged with five runs, four earned, on eight hits. He walked one and struck out three as he earned his third win of the year. New Britain tacked on one final run against Westcott in the sixth inning, but the Squirrels answered two-fold in the top of the seventh inning. With righty B.J. Hermsen on the mound, the Squirrels put the game away with two more runs. Lollis cracked a double to center field. Herrera followed and pounded a two-run home run to right-center field. Herrera’s sixth of the season stretched the Richmond lead to 10-5. Left-hander Tom Vessella worked two scoreless innings behind Westcott. Righty Jose Valdez then struck out the side in the ninth inning to punctuate the win for Richmond. The finale of the three-game series is scheduled for 10:35 a.m. on Thursday morning at New Britain Stadium. Richmond LHP Jack Snodgrass (4-0, 1.89) will make the start against Rock Cats LHP Pat Dean (2-5, 5.58). Pregame coverage begins on Sports Radio 910, SportsRadio910.com and IHeart Radio at 10:05 a.m.